Superman has been an icon of American popular culture since his introduction to the masses in 1938 by way of Action Comics #1. For nearly as long as the character has existed, iconic images of Superman have adorned the face of trading cards and this list will examine ten of the most popular or noteworthy of those sets. 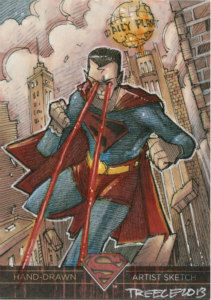 There is a long history of trading cards revolving around Superman and they include imagery based on the comics, television shows, and films. In addition to the many sets that have been devoted to the Man of Steel, he frequently appears in general DC Universe sets as well as releases geared to other characters. Shop for Superman Cards on eBay. Compiling a comprehensive list of top cards is nearly impossible when a character has been in the public consciousness for over three-quarters of a century. Superman's first set of trading cards, the 1940 Gum Inc. set, generates the most financial value due to the scarcity in collectible condition and a detailed list could be made of that set on its own. However, in order to offer a wide range of cardboard, we'll be looking at the top Superman sets from the golden age comic era, modern age comic era, television, film, crossover, and chase sets and factor in art quality, trade value, rarity, and historic significance. Because so many Superman-related sets came out during the junk wax era, many base sets are easy to come by and worth very little money, but some of the bonus cards from those sets can have a fair amount of value. This list will consider chase sets as standalone sets for the purpose of value collectors, but completists should track down the full base sets whenever possible. The breadth of Superman trading cards makes collecting an appealing challenge and while some collectors may choose to focus on movie cards or comic cards, the reward for completists is extraordinary. In 1982, to go along with their line of vitamins, Nature Made released a set of 12 DC trading cards in their products. Card #1, Superman, is joined by Lois Lane (#2), Lex Luthor (#5), Clark Kent (#6), and Supergirl (#8) along with a few other heroes and villains from the DC Universe. These cards are not worth a ton of money but they are fairly difficult to track down on the trade market and would be a great addition to any superhero card collection. The back side of the card has a short bio relating to the character on the front. In 2013, Cryptozoic devoted an entire set to the Man of Steel. The base set of 62 cards has beautiful artwork and quality design. However, the unique part of this set is in the "Artist Sketch" portion of the release, which come one to a box (1:24 packs) and feature hand-drawn artwork from over 100 different artists. The artwork on these cards is specific to the Superman universe, but they don't all feature the actual Superman character. Because of the sheer number of variations, combined with the one-per-box rarity, compiling a complete set of these cards will be time consuming and expensive. The price point, per card, is generally stable throughout the trade market, with certain cards commanding a higher or lower value on any given day, but that does not make this an easy collection to obtain. No collector of Superman can consider their collection complete without including memorabilia from The Death of Superman story arc of 1992. Quite possibly the biggest comic book event of the decade, the death and return of Superman spanned dozens of comics, inspired a novelization, and produced two separate SkyBox releases (one for the death and one for the return). Although the cards are not difficult to find and have very modest financial value, the four-card foil chase set is worth seeking out and purchasing for collectors. 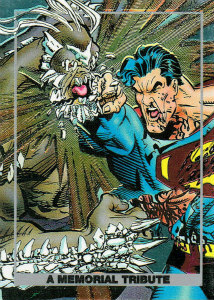 The images, in stunning full-bleed, depict Superman and Doomsday in the final minutes of their battle, the ultimate death blow, the reaction by Lois Lane and a tribute card that shows Superman looking down over the Metropolis skyline. These cards are beautiful additions to any card collection and their modest price make them accessible to even the casual collector. 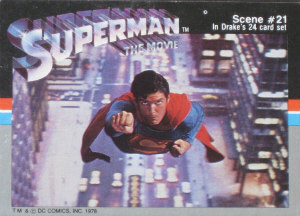 The 1978 Superman film, starring Christopher Reeve, spawned two sets of trading cards, with some images being identical between the two sets. The Topps set, which was released in two different series, totals 165 base cards and is incredibly easy to find online, often including unopened hobby boxes. The second set, released in specially marked boxes of Drake's Cakes, is only 24 cards, many featuring identical production stills, but is a little bit more difficult to track down. Complete sets pop up from time to time on online auction sites and individual cards are plentiful, but the cards consistently sell for a higher average than the Topps set on a per-card basis. For casual collectors of Superman, these cards are fairly obscure but easy to acquire. The set is small, so you may spend more on each card, but the narrow scope of the set makes this an affordable collection to have. 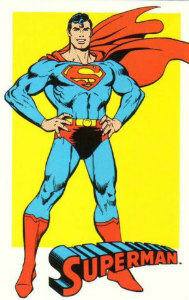 In the early 1990s, often referred to as the end of the junk wax era, SkyBox issued a number of cards that featured Superman. Among those cards were the very popular Skydiscs, which had a round hologram image on the front and a card back matching that of whichever set the card was a part of. The Man of Steel series, which was a tall-boy style set, traced the important historical milestones of Superman's life, from the destruction of Krypton, through his clash with Doomsday, and to his triumphant return. The Skydisc for this series was a 1:120 special card and, despite being relatively easy to obtain, is a fairly popular card and a great addition to a beautiful set of cards. That's not the only Superman Skydisc, though, as he is the man of the hour on a DC Master Series Skydisc as well. The Master Series is a gorgeous set of character cards, also from 1994, which does include Superman, as well as Superboy, Supergirl, and Lex Luthor, among the base set. The Skydisc from this set, like the Man of Steel set, is fairly easy to obtain but won't come cheap. 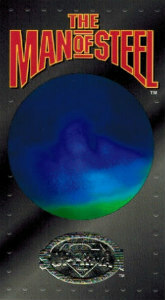 Smallville, a popular television show chronicling the young life of Clark Kent, was also the first Superman-based program to air during the current age of collectible trading cards. Sets by Inkworks and Cryptozoic featured numerous autograph and relic cards from the show's ten seasons and, when combined, totals an incredibly thorough checklist. Partly due to the following of the show and partly due to the popularity some of the actors have enjoyed prior to or following Smallville, the autograph cards from this series are very in-demand among collectors and continue to appear on the trade market for considerable value. 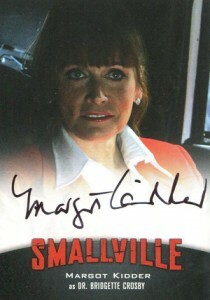 Also of note, the Smallville autographs do include actors like Margot Kidder and Dean Cain who, aside from their work on this program, are more famous for their work in other Superman franchises. In 1972, a series of 50 "cigar box" cards (they're usually classified as minis now) devoted to Superman was released by Primrose Confectionery in the UK. Tracking down cards in this set isn't particularly difficult nowadays but many of the cards on the trade market are graded which means that this can be an expensive set to put together. The artwork, with Silver Age design, is very striking on the front and the back of the card features a description of the action on the front. These cards came inside packs of "Superman Sweet Cigarettes," a candy cigarette for kids, and are on a thinner paper stock. This general fragility helps to explain why you're more likely to find a graded card than not because so many are in bad shape. This set is hardly mainstream and it'll take some digging to get much more information, but they are very lovely cards with an interesting source (all the images are native to this set), history, sizing, and they're international so it should appeal to collectors and general fans. It is worth noting that the copyright is listed as 1967, but these cards are almost universally considered a 1972 series, so listings for either date are, in fact, the same set of cards. The first television depiction of Superman was that of George Reeves who played the Man of Steel for 102 episodes from 1952-1958. In 1965, the Adventures of Superman series was sold into syndication, with seasons three through six seen in their original color for the first time. The following year, Topps released a 66-card set revolving around the program. 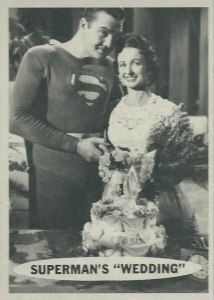 Card #42 of the set, Superman's "Wedding," offers a production shot of Superman and Lois Lane getting hitched. Upon reading the back of the card, it is discovered that this is simply a dream of Lois' and until this day comes true, she will "continue her work at the Daily Planet." Each card front has an image taken directly from the television show, often exposing incredibly low production value, and a title caption. The reverse of each card gives a short explanation of the scene depicted on the front. 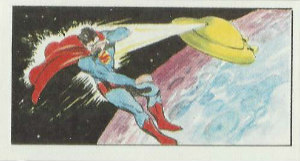 Clearly released to promote the syndication of the show, each card back has a bold heading of "Watch Superman on T.V." on the bottom. This set was released six years after the passing of George Reeves. In 1968, Topps released a test set of Superman in the Jungle with slightly over-sized cards to the US market. When the artwork was of no interest to the kids of the day, the set was instead sold through A&BC in the UK. The UK set is fairly common to find and is of reasonable value in recent years. The popularity of online auction sites has made them much more available and, therefore, lowered the value of these cards some over the years. The substantial value to this set is in finding the 66-card Topps test set. 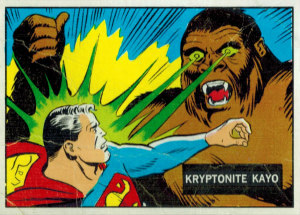 Test cards can still fetch a hefty return even in questionable condition and high-graded cards are among the most sought-after Superman cards of all-time. The artwork on each card, reminiscent of the 1966 Black/Blue/Red Bat series, is fairly crude and simple. Norm Saunders, who did the ink work on the cards, does contribute a stunning die-cut puzzle that was sold with this Superman set. It is probably safe to assume that if the artwork of the set matched the quality of the puzzle, the set would have been more popular in the US despite the subject matter of the set being unorthodox and borderline cheesy. 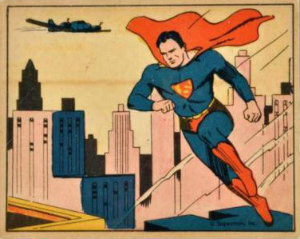 The artwork depicts Superman in his Silver Age incarnation. Released two years after Superman's comic-book debut, this 72-card set is both striking and rare. As recently as September, 2015, card number one of this set, in ungraded condition, sold for $1,900. Even the wrappers or display boxes from this set can fetch hundreds of dollars. Each card shows the iconic Golden Age Superman in action-packed scenarios with the reverse of each card describing a scene or character. Cards #49-72 are considered short prints and command top dollar based on the scarcity. These cards are not standard size, as sizes had not been standardized in 1940, and are a bit smaller than modern cards. In 1984, there was a reprint, with original specifications, of the entire set. The reprint was done in very high quality and is clearly labeled as a reprint on the reverse of the card. These reprint sets are commonly found, in full, for a reasonable price and offer a good alternative to collectors who want to see the imagery of each card without spending thousands of dollars for a vintage collection. Superman has managed to remain popular and relevant for 80 years and with the continued release of television programs, comic books, and major motion pictures, there will surely be no shortage of trading card collectibles released in the future. 1994 SkyBox Superman: The Man of Steel Platinum Series S 2,3 4 Inpenetrable! 1996 Superman Holo Series Holoaction GOLD 4 INSERT card Set H1-H4! HOLOGRAM!! 1993 DC BLOODLINES SUPERMAN PROMO COMPLETE 5 CARD SET! P1-P4 + UNNUMBERED!! Excellent article! I’ve been collecting since 1988 and I still learned stuff here. (Specifically, the Primrose set is totally new to me). One small correction though- the Smallville cards were produced by Inkworks, not Inkwell. Sorry, I’m OCD. Those Primrose cards are the ones I want the most, now! I’ve got the 1940 reprint and probably won’t spend the money on the vintage (at least not high graded) and I’ve got a number of the 90’s sets but those Primrose cards are really calling to me! Cool lookin cards. Thanks for the write up ? Deffinetly will be keeping an eye out for these.